Where do you go when you are craving South Indian food in the Albany area? My favorite place to eat a masala dosa in Albany is Parivar Spices and Food, an Indian supermarket at 1275 Central Avenue in Albany, New York. Look at this Mysore Masala Dosa that is paper thin and delicious. 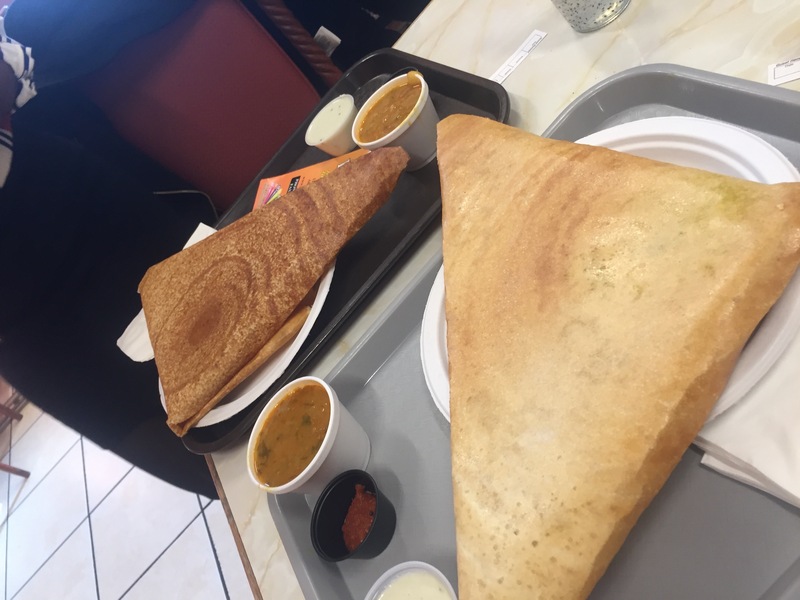 That dosa is big enough for two or three people. The 13 different Indian dosa pancakes are served with savory spicy sauces for dipping and are generously stuffed. There are a dozen different dosas to choose from. You can also order the full meal or mini-meal with different sides as well. I highly recommend Parivar! In addition, you can browse and shop the aisles of zillion imported Indian staples, rice, tea, lentils, etc. The casual cafe is in the back of the store. Check out their Facebook page to see their full menu of South Indian and chat foods. I’m so glad you found Parivar! It’s one of my favorites (although I am overdue for a visit).